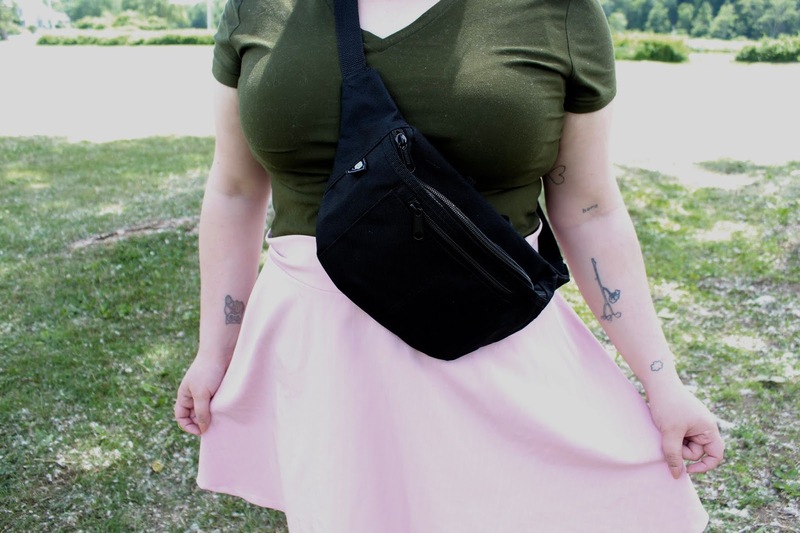 Personally, I’ve always been a big fan of fanny packs, despite their bad rep. Not only are they super convenient and handy, they are also a really fashionable trend this year. Fanny packs were all over the runway for spring, and I think they have a chance of sticking around. 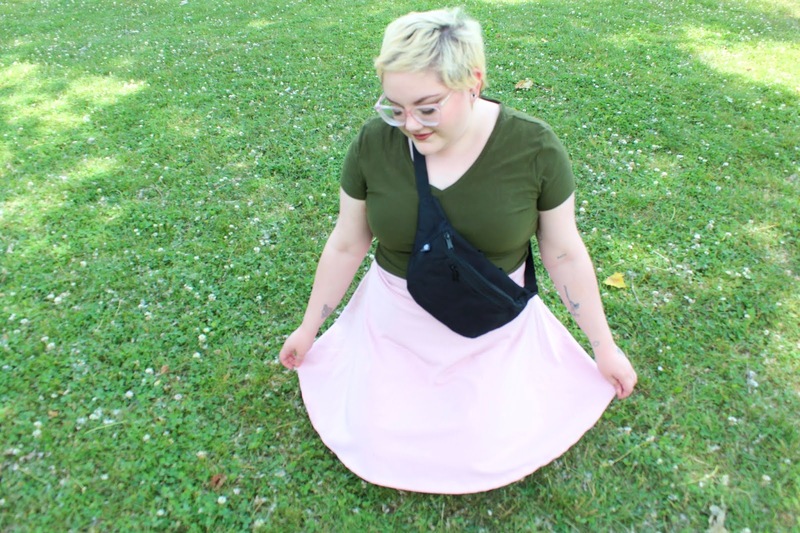 They are a practical bag that can be worn by anyone, and they are the ideal size for holding just the essentials. 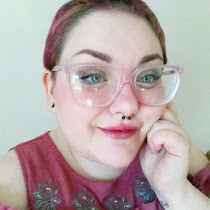 I started a new job just over a month ago, which is why I haven’t been posting much on my blog. It’s a decent job and it makes me money, so that’s all that matters. Since I started work, I’ve been almost exclusively using my black fanny pack. It’s so easy to grab from my locker, and sling over my shoulder, then proceed to get out of the building as fast as possible. It also adds a bit of classic style to my look. Because of its practical, neutral look, my thrifted black East Sport fanny pack can go with just about anything. 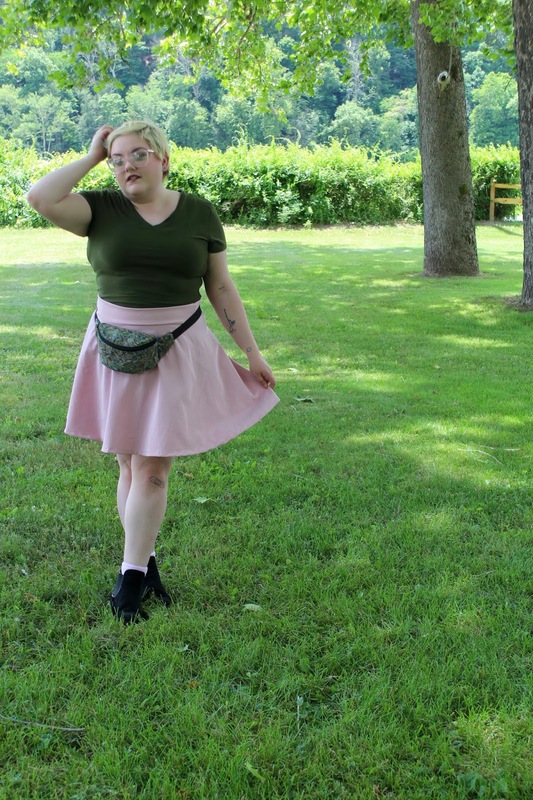 However, I decided to style it by wearing my favorite colors (green and pink), and adding accents of black from the fanny pack and shoes. 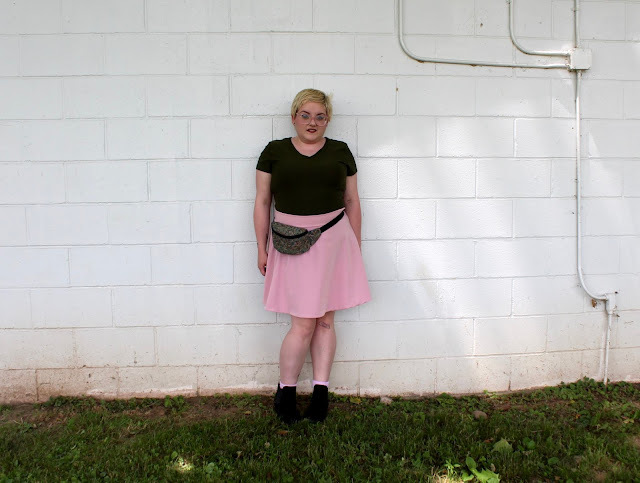 For a dollar investment, this fanny pack has been more than a great addition to my wardrobe. 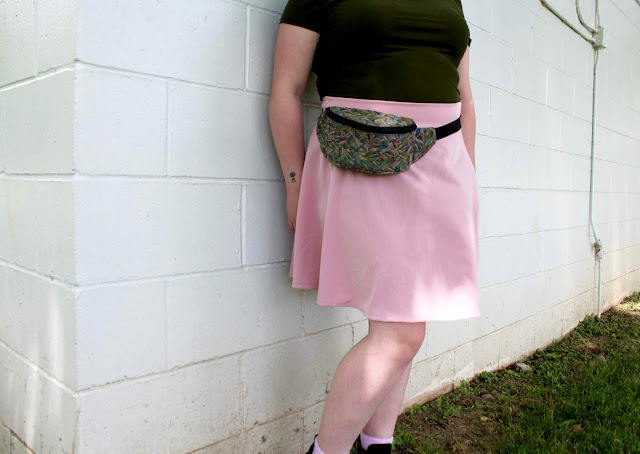 I then paired the outfit with my one other fanny pack, a patterned L.L. Bean bag that my mom picked up for me at a thrift store as well. It goes so nicely with my favorite green shirt, and even has a bit of black to go with the shoes. Both bags are the perfect match for this outfit, and most of my outfits, since I generally go for green, pink and black clothing. 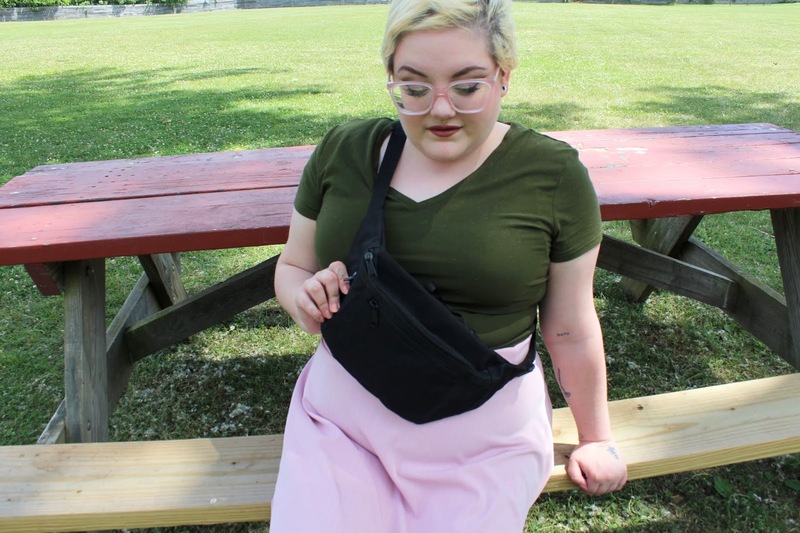 Fanny packs are such a sensible bag, but they can also be a fun accessory and statement piece. In the junior’s section of the store I work there are small iridescent fanny packs with cat faces and ears on them. Pre-teen me definitely would have bought one. However, I am very happy with the two fanny packs that I currently own. 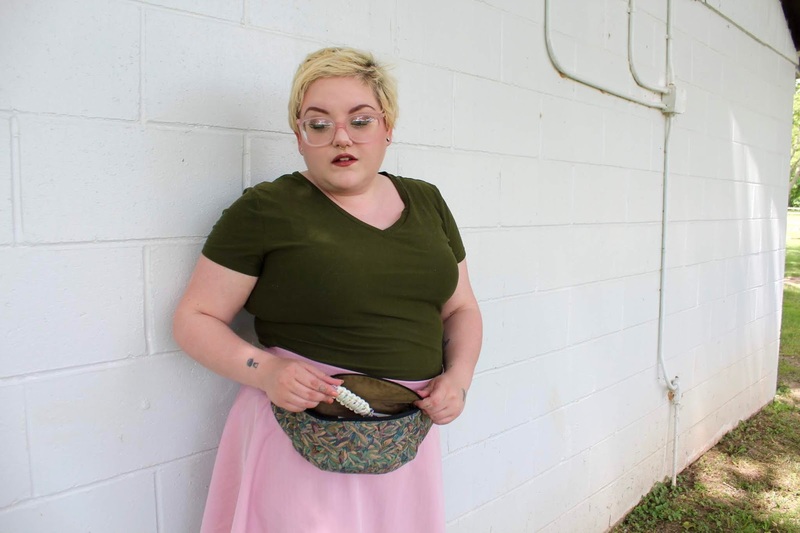 I highly recommend that everyone own two good fanny packs- one neutral bag, and one statement bag.